Each year my son and I take a fall trip to the mountains. Having spent most of our lives in Florida, fall has become somewhat of a destination for us. 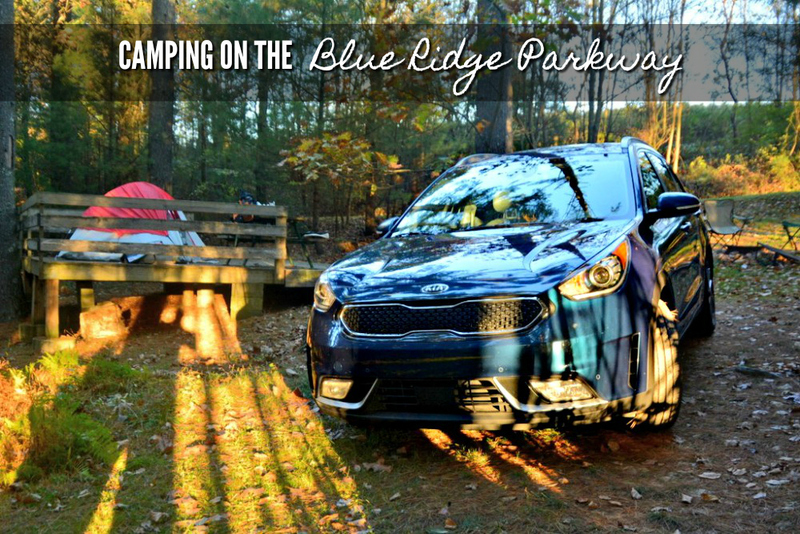 This year we were sponsored by Kia to take the 2017 Kia Niro Hybrid from the Great Smoky Mountains to southern Virginia, all opinions are my own. This is a story about our fourth night when we went tent camping on the Blue Ridge Parkway and spent the night stargazing. It’s also about the importance of unplugging and coming together as a family. You can NEVER really grasp how long an off the grid scenic drive is going to take. That was a lesson we learned the hard way when we hopped on the Blue Ridge Parkway in Cherokee, NC following our drive through the Great Smoky Mountains National Park and into Linville, NC. First, it would be vital to note that there is little to no data in these backcountry parts of southern Appalachia. That said, Google and other GPS navigation do not recognize the BRP as a route and it will constantly reroute you to the freeway. So, unless you have an old school atlas, you’re committed to the Blue Ridge Parkway once you get on. And by committed I do mean at 35 mph and twice the time it would normally take to get between points. Still, in all fairness, it is an incredibly beautiful drive and worth planning ahead for. Light fades fast in this part of the world during fall months. We had just spent the day driving from Linville Falls, NC and were on a mission to arrive at our reserved tent camping on the Blue Ridge Parkway. It was colder than it had been any other night but we were prepared. When we arrived at Miller’s Campground it was dark. We knew setting up camp had just gone from fun to challenging, but that’s part of the adventure right? We backed the Kia Niro Hybrid into our space, shut the car off and paused. Complete and total silence filled the woods around us. We were in the middle of nowhere. It was super dark when we arrived. Sean quickly started a fire for light while I set up the tent by the light of our lantern. Gauge put together glow bracelets for us and a glow collar for the dog and in no time, with some solid family teamwork, our camp was ready for dinner. As I was handing over food for the fire, I paused to take a mental glimpse of our family in action. I was proud of us for pulling it together in the freezing cold, in the dark, just us. I knew the temperature was dropping even more so I began to get everyone layered up, even the dog. A few months back Minus33 had sent Sean a long John and thermal set made of super comfy lightweight wool that we were about to put to the test. It’s rare but I caught Sean smiling and playing guitar at the same time. Sorry for the blue, it was basically like catching Bigfoot on camera. The camp was comfortable. Sean was playing his guitar and Gauge was playing with his glow things, the dog was even having a blast. There we were, huddled by the fire and roasting marshmallows when Sean looked up at the sky with an audible gasp. And I had to agree. Right there we all froze, completely awestruck by the seemingly endless amount of stars that glittered in the pitch black sky. I literally could not stop staring. We all tried to get photos of it but justice would not be served by photos alone. So, we paused, gazing in utter appreciation of this magnificent world and its splendors. We were not plugged in, we were not watching YouTube videos or checking status updates. We were appreciating the universe and its capacity to blow our mind. Something I think our kids aren’t doing nearly enough in this age. The night pressed on, the fire went out and with full bellies, we got in the tent. Myself, Sean, Gauge and the dog all huddled together in 33 degrees pulling our sleeping bags over any inch of skin that might have been exposed. And before long, our cozy campsite and all of its twinkling stars drifted away as we fell asleep. I wholeheartedly believe that this was the day we became a true family. A modern family. Of course, Gauge is my son but Sean is only a year in with us. We needed each other to keep warm, and making each other a priority via this need gave us a sense of security, loyalty, trust, and unconditional love that nuclear families have. There’s a whole lot of bonding that goes on when you’re freezing alone but warm together. The boys were asleep when first light broke so I snuck out of the tent to see what rays would be peeking through the trees. The campsite took on a whole new mood by day. The leaves were bright, the air was fresh and the sky was clear. It was early but it was also time for another adventure. As we packed up our things and closed the trunk to the Kia Niro Hybrid I stopped one more time to pause and appreciate the special little spot where we went tent camping on the Blue Ridge Parkway and became a family. There are a number of car camping options too if you want to be a bit more adventurous! We spent a year with the Kia Niro Hybrid and we love this car! Coming from a Kia Sorento, it was a little bit of a change to get into a crossover, but the comfort and handling of this car made it easy to fall in love. I live just outside of Atlanta which means I deal with a lot of heavy traffic in all kinds of weather. I always feel super confident behind the wheel. The safety features and advanced technology give me a sense of my surroundings and driver control that I’ve never had before. The sport mode gives me the get-up-and-go that I need to get around traffic. The feel behind the wheel is 100% reassuring. I never feel out of control in this car. And with the amount of money we save driving a vehicle that runs on EV and fuel getting a combined 50mpg, adventures are that much more doable. Want to know more about this crossover? Check out Kia’s cool website full of specs and video content here and check out the video below! Heading to Pigeon Forge? Or are you shopping for a new car? Ask me anything in the comments below and I’ll get back to you right away with my best answers!